The Islands platter. A fun large plate that showcases my Vancouver Island surroundings. 14 inches diameter, porcelain, wheel thrown, painted with underglazes and slips, clear glaze fired to 1280 degrees Celsius (cone 10) in an electric kiln. Laude/Rebec teapot. Porcelain, with reed and porcelain handle, additional helper knob on lower back of teapot, holds 2500ml. 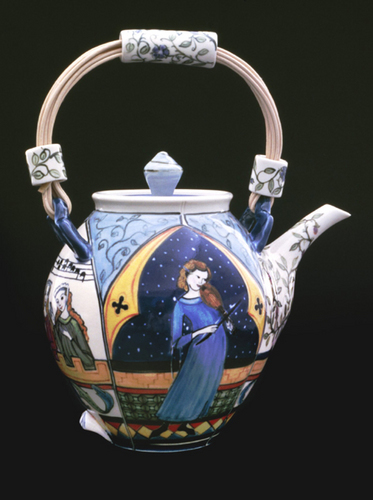 A commissioned gift for a medieval choir member led to the enjoyable research into imagery for this large teapot. The two side panels under the indented arches depict nighttime music scenes: on this side a rebec player; on the other side is a harpist. The spout and back ends are daytime scenes: the spout end sprouts a briar patch and the back end pictures damsels listening to music. 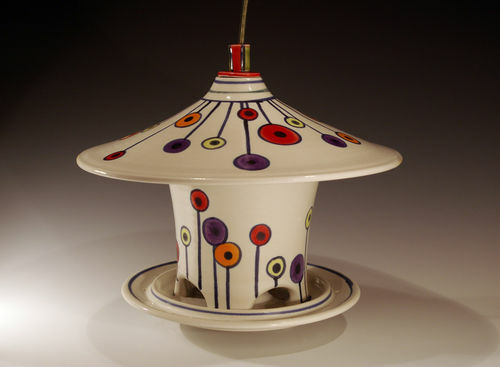 Porcelain bird feeder with coated steel cable and ceramic beads, wheel thrown in 4 pieces and assembled. Lift the lid to fill with seed. Virtually squirrel proof as they find it impossible to hang on. Includes drainage holes. Clay portion is 12 inches across, 12 inches high. Other colours and patterns available. "Sara's Kitchen" is a custom tile project made for a +500 year old house in England. The subject was inspired by the owners' garden. This detail shows one corner of the alcove surrounding the cooker (a corner of the cooker is visible, as well as the fan control at the top). 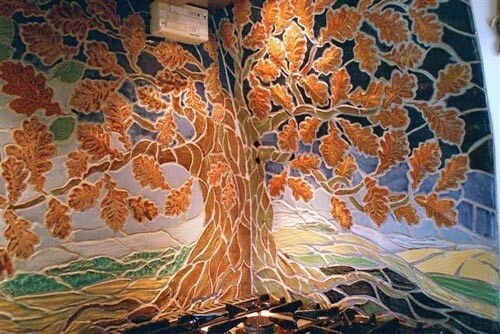 More than 1000 individually shaped tiles make up this mural. A white stoneware clay and custom colourful glazes were used, fired to 1280 degrees Celsius in an electric kiln. 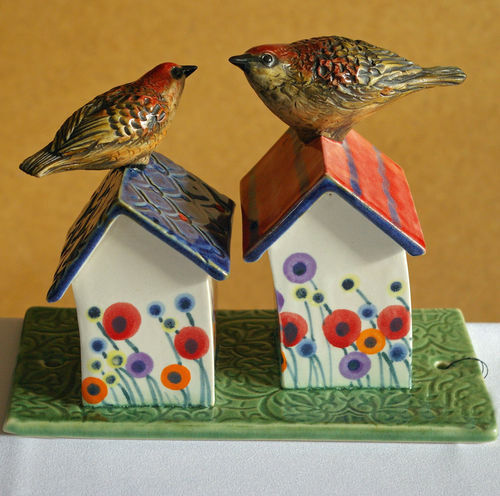 These little birds and birdhouses perch atop a fence tile. Designed to be mounted on a fence or gate rail, made of high fire stoneware and porcelain, this fence art is durable enough to stay outside in all weather. Secure the tile to your fence using the two screw holes provided. Of course may also be enjoyed indoors! 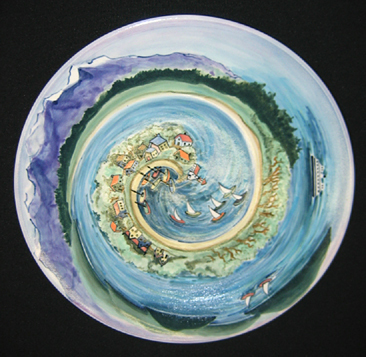 VISIT my website: www.cindygibsonceramics.ca and check under "events" for further information. Studio visits are welcome. Please confirm in advance.